Wonderful question from a very recent Time Management using Outlook course held on-site. Question: How can I make sure that I never forget an attachment when I send an email using Outlook? Answer: If you use Outlook 2013, the feature is built into the programme so all you have to do is make sure that it is enabled. If you use an older version of Outlook however, then you can either download a third-party addin (some free, some at a cost) or type a few lines in the VBA window. In Outlook, click File then select Options and select the Mail section of the Outlook Options window. Scroll down to the Send messages features and make sure that this option is enabled: Warn me when I send a message that may be missing an attachment. A screen capture is worth a thousand instructions, so here is the Outlook Options window in question. 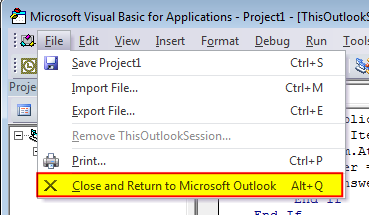 Press ALT+F11 to open the Microsoft Visual Basics for Applications window. 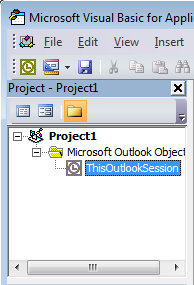 In the Project Explorer window, expand the project structure until you see ThisOutlookSession. Double-click ThisOutlookSession. A code window opens in the main part of the screen. It is probably a blank page for you. What this code does is check for the text ‘attach’ in the body or subject of a message after you click send and displays this warning if it finds ‘attach’ but the number of attachments is zero. At this point you can cancel or continue as shown. Go on, try that now. Paste the code and send a message. Type ‘attachment’ in the subject or body but don’t attach anything to your email. Did it work? Leave a comment. This code works as of the date of publication of this post but once more, try at your own risk. Nice tip, François 😉 Keep it up, love this blog. What about if you have multiple accounts? Can you make it remind you when you forget attachments on all of your outlook email accounts? The VBA code is not account specific so it should work whatever the account you email from.